The HSBC Platinum Mastercard with Rewards currently has an Informr score of 6.9 out of 10. This score is based on our evaluation of 3 sources including reviews from users and the web's most trusted critics. HSBC Platinum Mastercard with Rewards is typically available to those with good credit scores (650 or greater). With an anemic rewards rate and a middling APR, the HSBC Mastercard ranks near the bottom of our list of travel cards. The HSBC Platinum Mastercard with Rewards charges no annual fee, which is a big plus. You can earn rewards at your own pace and redeem points whenever you’re ready. 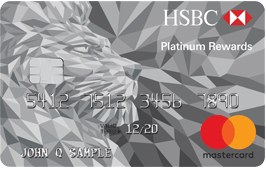 HSBC Platinum MasterCard® with Rewards credit card is a straightforward rewards credit card that lets you earn 1 rewards point per every dollar spent on new, net card purchases. It has a $0 foreign transaction fee, solid travel insurance coverage and shopping benefits. Earn an Introductory 3X Points on all purchases in the first 12 months from Account opening, up to the first $10,000 in purchases.